Do you often find yourself, doing repetitive tasks over and over again in Excel and wishing that somehow, someway these tasks could be automated? Well, the good news is that these tasks can be automated using macros. What are macros? Well simply put, they are small concise pieces of VBA code that allows one to automate tasks. What is VBA you ask? Well VBA stands for Visual Basic for Applications, a programming language native to the Office environment that allows one to extend the functionality of Office. VBA is quite a versatile language and you can use it to create macros, manipulate values in cells, and open and create workbooks among other things. Once you really get beyond the basics, you can manipulate Word, and PowerPoint from within the Excel VBA environment. So it’s quite a useful skill to have. Simple macros can be recorded, however without ever engaging with the Visual Basic environment extensively. Using the macro recorder, Excel records all one’s actions one performs in the workbook you are using, so for example if one copies and pastes, the macro recorder records that. The macro recorder functionality is also a good assistant with respect to learning VBA code. Once you’ve recorded your macro you can access it via the developer tab, or allow the user to have a button that once clicked, runs the macro. So why start learning about macros, well it helps with learning programming concepts in addition to increasing your functionality in Excel and Office. The button click event for example, and how it works, can be demonstrated and quickly conceptualized with a macro. In Excel, one can also access worksheet functions and use standard worksheet functions such as VLOOKUP, in VBA. Also once you get started, you’ll want to learn more, so you can take your VBA programming from beginner to advanced and become a super user and programmer all at once. So, in order to help you get started with macros, we have put together a list of helpful books. What if you already know a bit of VBA and want to extend your knowledge, well we didn’t forget you either and we have listed books specifically for the advanced VBA users as well. 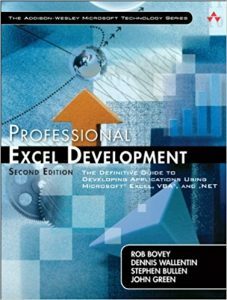 Here I’m listing the best books that you can start with your Excel VBA mastering journey. My this list will make you a professional VBA use from a stage where you know nothing. Share your opinion in the comment box. How different is VBA from other programming languages? I’d like to express my admiration to your blog, it’s very useful and informative and I deed go to know alot of information. I really seek to learn the VBA programming, currently I am using Excel 2013 at my work do you think I should buy VBA for 2016? or stick with 2013? Thanks for the feedback on our blog. Actually, this is not a big deal. The concepts are same with both Excel 2013 and Excel 2016. Most of the variations/updates occur with the Excel features, not in VBA. Just start with what most suit you. I hope this reply helps you. Thanks for sharing these excel vba books. These are really informative. These books provide fundamental tools and features of Excel that make your work easier. These also define the usefulness of VBA programming with Excel. While giving you step by step instructions to create your own macros, it will deliver you the most out of Excel program. Do you freelance? Need help with a project. Old. Unsure if I could learn. I am sorry, I am not available for freelance.